Revolutionary, kink-free Flexzilla® Air Hose was a game-changer that has upped the ante for a traditional commodity product. It’s durable, it’s field-repairable and it’s made with a high-quality Flexible Hybrid Material that stays flexible down to 40 degrees below zero. Extreme all-weather flexibility quickly made Flexzilla the industry leader. Then Flexzilla Garden and Water Hoses revolutionized gardens, yards and work sites. Lightweight, user-friendly ZillaGreen™ hose wont kink under pressure. Unlike heavy, stiff, old‑style hoses, it works with you, not against you. Users find Flexzilla fun and easy to use. 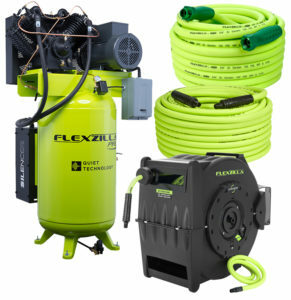 And now Flexzilla offers Extension Cords, Pressure Washer Hoses, Grease Guns, Work & Garden Gloves, Air Tools, and Air Compressors to make work and domestic chores easier than ever. Leading-edge technology and premium materials give Flexzilla the dominant edge over traditional products. Our full line product catalog can be viewed on your desktop or tablet. Or call 800-645-8258 to inquire about our product line. The color CHARTREUSE as applied to the body of the air hose, battery operated grease guns and accessories, extension cord, and work and garden gloves is a registered trademark owned by Weems Industries, Inc. The color CHARTREUSE as applied to the body of the air compressor, air hose coupler and plug, air tool, blow gun, grease gun, water hose, and water hose nozzle is a trademark owned by Weems Industries, Inc.